從 Google Blogoscoped 看到「Yuil」這篇，有人用 Google App Engine，拿 Yahoo! Search BOSS 的結果，與 Cuil 的介面的 Mashup !!! This entry was posted in Computer, Joke, Murmuring, Network, Recreation, Search Engine, WWW on July 31, 2008 by Gea-Suan Lin. This entry was posted in Computer, Murmuring, Network, WWW on July 29, 2008 by Gea-Suan Lin. This entry was posted in Computer, Database, Murmuring, MySQL, Network, Software on July 27, 2008 by Gea-Suan Lin. This entry was posted in Computer, Murmuring, Network on July 25, 2008 by Gea-Suan Lin. 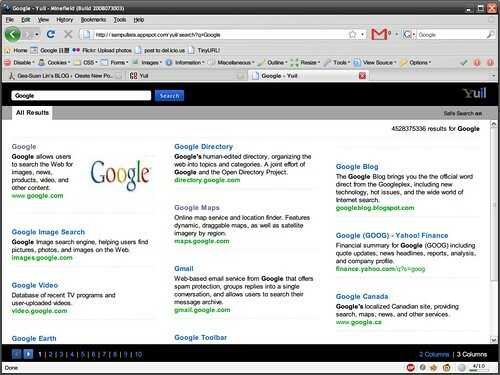 This entry was posted in Cloud, Computer, Murmuring, Network, Programming, WWW and tagged app, cloud, engine, google, perl on July 23, 2008 by Gea-Suan Lin. This entry was posted in Computer, Murmuring, Network, Programming, RSS, Software on July 23, 2008 by Gea-Suan Lin. This entry was posted in Browser, Computer, Firefox, Murmuring, Network, Software on July 22, 2008 by Gea-Suan Lin. This entry was posted in Computer, Murmuring, Programming, Software on July 20, 2008 by Gea-Suan Lin. The first one is 55887 qps (avg), the second one is 58406.3 qps. This entry was posted in Computer, Database, Murmuring, MySQL, Software on July 19, 2008 by Gea-Suan Lin. This entry was posted in Computer, Murmuring, Recreation, Search Engine, Television on July 17, 2008 by Gea-Suan Lin.